History of Sheet Metal Fabrication: From Egyptian Jewelry to CNC Machining Services - York Haven Fabricators, Inc. Precision CNC machining services are essential to dozens of modern industries, including the military, health care, lighting, automotive, and energy industries. Currently, industrial sheet metal is the number one most common type of metal used in manufacturing jobs, and you can even find plates of sheet metal lining the iconic art-deco facade of the Chrysler Building. Without precision CNC machining services, the industries that rely on metal fabrication would be significantly less productive and constantly struggle with fabrication efficiency and metal quality. Luckily, thanks to advancements in technology and metal fabrication, 5 axis machining is a viable option for machining companies across the globe — but it wasn’t always that way. Sheet metal itself has been used for countless purposes across the millennia. In fact, scholars estimate that sheet metal was first used at some point between 5,000 B.C. and 4,000 B.C. Early sheet metal fabrication can even be traced back to Egyptian jewelry, which utilized natural metals like copper, silver, and gold and some prehistoric techniques to achieve a luxurious appearance. Ancient Egyptian metalworkers would overlay a copper alloy with gold or silver sheets, which was shaped into place. Similar techniques were likely used by other early civilizations, and sheet metal has been observed in Roman and Mycenaean artifacts as well. These techniques all utilized malleable metals like gold or silver, which allowed metal workers to rely on simple hand tools such as hammers. During the 1400s, Leonardo da Vinci famously drew a sketch outlining his idea for a rolling mill, which debuted about 100 years after his sketch. The famous 1590 rolling mill featured two heavy cylinders that pressed various kinds of metal to alter their thickness — an old fashioned, but effective, fabrication technique. Following the first rolling mills, the 17th century saw factories heating up cast iron in order to liquefy material in furnaces, but it wasn’t especially effective since it relied on a single flame. Industrial plants, however, soon began producing lead and tin plates, while Russian engineers began designing a new system for heating metal: a hydronic-based heating system. While inventors and metalworkers around the world experimented with various sheet metal fabrication techniques, the history of sheet metal really began in earnest in the lead up to the Industrial Revolution. This exciting time in manufacturing history resulted in a surge of sheet metal fabrication work, new innovations, and, eventually advancements in workplace regulations and technology that are still in place to this day. A combination of improved heating sources and advancements in rolling mill design allowed metal workers to create large amounts of sheet metal from a wider variety of metals. In fact, the rolling mills developed during the Industrial Revolution are very similar to the machines used in metal fabrication today. The history of machining began with a very basic tool. Shears, essentially heavy duty scissors, were used to cut sheet metal into desired shapes. Of course, as technology improved in the 19th and 20th century, sheet metal machining evolved past the shear. 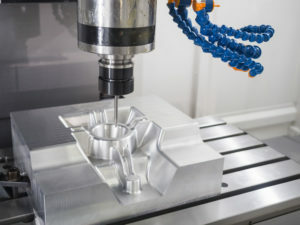 With the advent of computer science in the 1950s, metal workers could use precision CNC machining services to create ever more sophisticated parts. Eventually, precision CNC machining services evolved into the high tech 5 axis machining used by our metal fabrication company today. Thanks to precision CNC machining services and other high tech advancements, the future of sheet metal looks just as promising as it did in the past. It’s estimated that the international metal fabrication equipment market will grow by nearly 7% by the year 2020, and it will likely continue to rise in the years that follow. If you want to learn more about our precision CNC machining services or work with a Pennsylvania CNC machining company to ensure a high quality metal fabrication job, contact York Haven Fabricators today. © 2017 York Haven Fabricators. Quality Management Systems Registered to ISO 9001:2015. All rights reserved.